The Paramount 2 kit now comes in a super sturdy plastic box with the really useful fly tyers desk tidy. 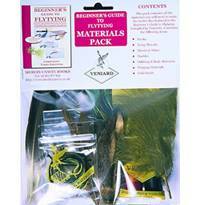 This, along with a great mix of both traditional and modern materials, tools and instruction booklets, gives a fantastic kit with everything you need to tie an huge range of great flies. 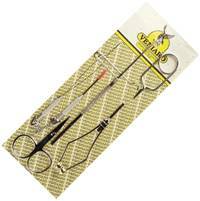 -The Pinnacle Fly Tying Kit is Veniard's most comprehensive kit containing materials tools a vice and hooks to tie hundreds of different patterns of flies. - Packed in a superb quality European made plastic box. - The Zenith box has a large deep top storage section and 4 trays that slide out all with adjustable sections. - Designed to be strong enough to sit on, it has a convenient carry handle on top making it the perfect mobile fly tying case. - The complete Pinnacle kit and box. The Zenith box has a large deep top storage section and 4 trays that slide out all with adjustable sections. Designed to be strong enough to sit on, it has a convenient carry handle on top making it the perfect mobile fly tying case. 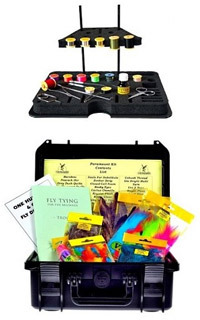 This kit addresses both the traditional and newer trends in fly tying with a plethora of materials, there is enough in this kit to satisfy the keen beginner and established tyer alike. New for 2016/17 now with a No.12 Lever Vice. It is ideal for any level of experience, in all areas of the craft. There is a heavy emphasis on new materials such as Glister, Cactus & Krystal. The hooks supplied cover a variety of types of prime quality. There is a basic set of tools included. 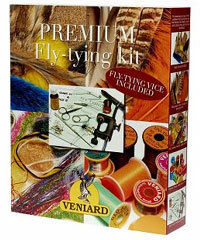 A great starter kit of tools to compliment our fly tying kits. A great starter kit of tools containing: Threader, scissors, bodkin, hackle pliers, spigot bobbin & whip finish tool. A tough varnished plywood case with a removable tray. The sturdy handle will take any C clamp vice. Specially designed for fly tyers. Dimensions 18" x 12" x 6"
The materials in this kit have been sourced to compliment the book and has enough of everything, including hooks used to tie any of the patterns, it gives an excellent insight into all the bits and pieces which make fly-tying such an absorbing craft and pastime.